Bullion value is the value given to a coin based upon the amount of metal that the coin contains. Some coins are made out of copper (pennies), clad copper/nickel (nickels, dimes, quarters, half dollars and dollars dated 1965 and after), silver (dimes, quarters, half dollars and dollars dated 1964 and before) and gold (1933 and prior). Additionally, the mixture of precious metals and base metals has changed over the years. It is important to look up the specification of the coin to determine the exact percentage of precious metal. For example, if a coin weighs 0.2 troy ounces and is made out of 90% silver, it will have 0.18 troy ounces of pure silver in it. 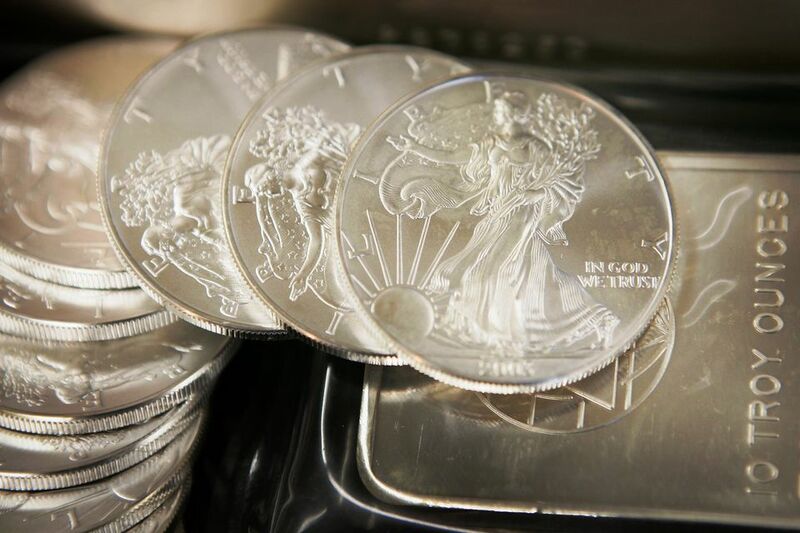 If silver is selling for $20 per troy ounce, the coin will have a bullion value of $3.60. Convert the Actual Weight from grams to troy ounces. There are 31.1035 grams in one troy ounce. Therefore, divide the actual weight of the coin by 31.1035 to give you the actual weight in troy ounces. Multiply the Actual Weight in troy ounces by the percent fineness as a decimal to give you the net weight of pure silver. Multiply the troy ounces of pure silver by the current spot price of silver. I am using $20 per troy ounce for this example. In addition to buying bars of precious metal, there are several numismatic opportunities to invest in coins for their precious metal bullion value. United States coins dated 1964 and previous including dimes, quarters, half dollars and dollar coins were made with 90% pure silver. Some of these coins have extremely low mintages and are sought after by coin collectors. Almost always, the numismatic value of these coins will exceed their bullion value. High mintage coins that are common and in well circulated condition can be purchased from your favorite coin dealer at a slight premium over their bullion value. Rolls and bags of these coins can be purchased for a price based upon their precious metal value. They are usually priced at a multiple of face value depending upon the current spot price of the precious metal. This coin is in such bad shape, it is only worth bullion value to the dealer.